John Finn was born on July 24th 1909 in Los Angeles, CA. He joined the Navy in July 1926 at age 17. After basic training in San Diego, CA., He was assigned to the ceremonial guard company and in December of 1926 John reported for General Aviation Utilities training in Great Lakes, IL. In April of 1927 John reported to NAS North Island and was assigned to the wing shop, aircraft and repair division and then in July of 1927 was assigned to the Ordnance Division and became an official Ordnanceman and worked on the south end of North Island on 4 gun emplacements of 3" 50 caliber Anti-Aircraft guns. 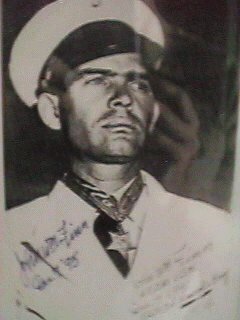 AOC John W. Finn was awarded the Congressional Medal of Honor on September 15, 1942 by Fleet Admiral Chester Nimitz aboard the USS Enterprise. Click here to read the citation for John's medal. Continuing his career, John joined the ranks of "Mustang" officers as Ensign then Lieutenant Junior Grade and finally Lieutenant in 1944. After 21 years of distinguished service, Lieutenant John W. Finn retired from the United States Navy. To honor John Finn the Aviation Ordnance Museum was officially dedicated in his name at the AO A-School Naval Air Technical Training Center (NATTC) in Millington, TN., the contents of which is currently being cataloged and packed and will, along with the bomb truck, be moved by BRAC money to Naval Air Schools Command in Pensacola FL. The museum will then be re-established and set up at the AO A-School. Additionally, during the Association of Aviation Ordnancemen convention one outstanding enlisted Navy or Marine Corps Ordnanceman is selected, from dozens submitted by their command, to receive the John W. Finn Aviation Ordnanceman of the Year Award. In December 1995 John and his wife Alice traveled back to Hawaii and were honored at several military affairs commemorating the 50th Anniversary of the end of WWII. John was chosen to toss a memorial wreath of flowers into the waters of Pearl Harbor from the flight deck of the USS Carl Vinson along with President Clinton. It is believed that John is the first Medal of Honor recipient of WWII and he is the last surviving Medal of Honor recipient from the day of infamy.